Although this may not be an issue within your shop, if sending spot color separations done using Photoshop CS6 to another party, be aware they are not compatible and will preview incorrectly with Photoshop versions CS2 or earlier as illustrated below. This is an issue with Photoshop CS6 itself and Adobe has no intention to support spot channel compatibility with any version of Photoshop earlier than CS3. Here's a color separation done using CS6 opened in Photoshop CS4. There are no issues whatsoever and all appears normal. Its also normal if using CS3, CS5, CS5.1 and CS 5.5. 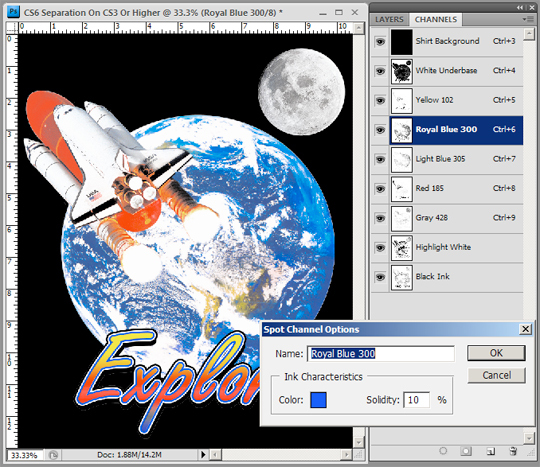 Here's the same CS6 color separation opened in Photoshop CS2 and there's major issues with it. Notice the spot channels have been changed to Alpha Channels and all the correct color information is not recognized. 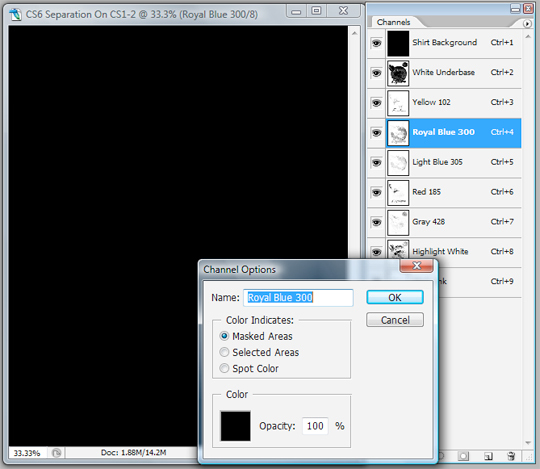 If opening with CS1 or earlier, the image data within the channels themselves is also gone. Countless people continue using very old copies of Adobe Photoshop so keep this in mind when sending a spot channel separation created within CS6 to someone else outside of your shop!